At Four Seasons Resort Bali at Jimbaran Bay, one can savour world-class cuisine and spectacular Bali views at the resort’s selection of tropical open-air dining destinations even if you are not staying at this authentically Balinese luxury resort nestled right on the oceanfront. 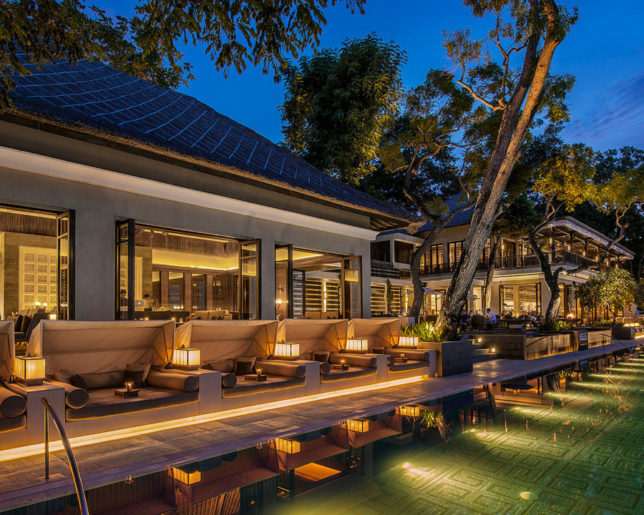 Traditional, timeless and romantic, this legendary hideaway was listed at number 14 of Asia’s Top 40 Resorts in the Conde Nast Traveller Readers’ Awards 2016, and achieved a coveted Five-Star Rating in the Forbes Travel Guide 2017. 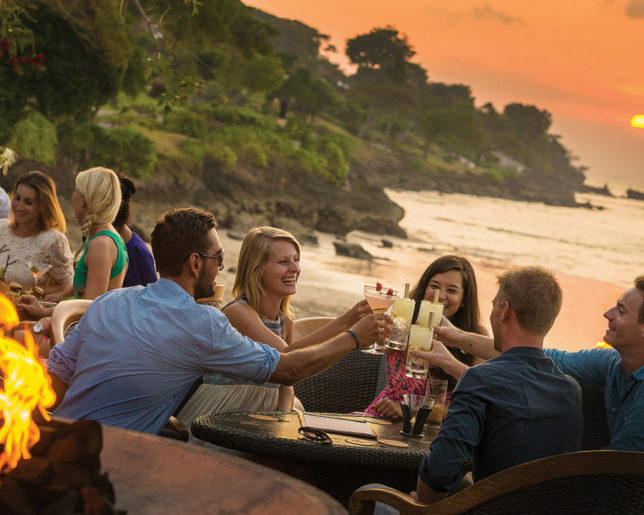 Praised as one of the best beach clubs in Bali, Sundara is an all-day lifestyle destination that brings the best of relaxed beach-club vibes, stylish dining and live music to the beautiful shores of Jimbaran Bay, Bali’s most exclusive stretch of sand. 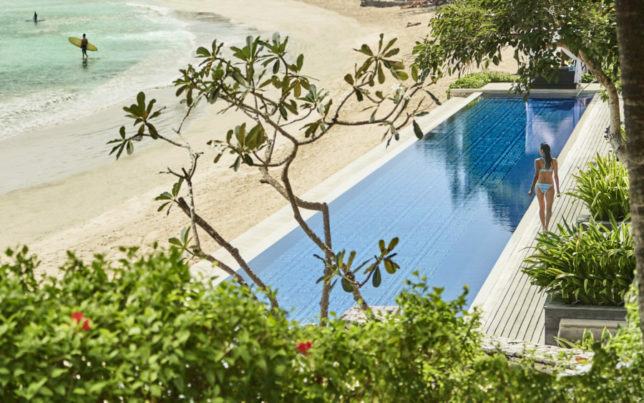 The Sanskrit word for “beautiful,” Sundara describes the lush flora and sparkling surf at this beachfront hotspot. A sultry beach-club by day, iconic restaurant by night, it offers the perfect mix of five-star flair and relaxed beachside vibe. 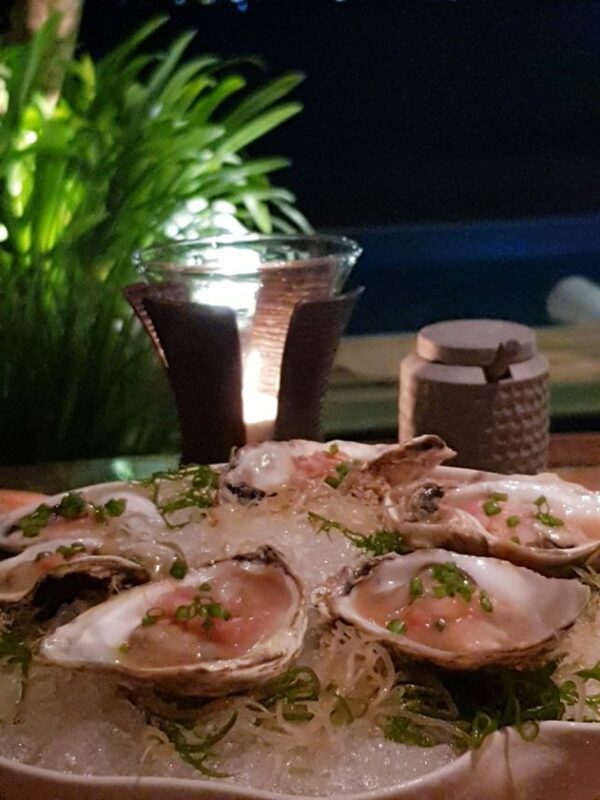 The restaurant uses local and organic ingredients whenever possible, from fresh Jimbaran seafood and local pork and chicken to the freshest produce sourced from local growers. 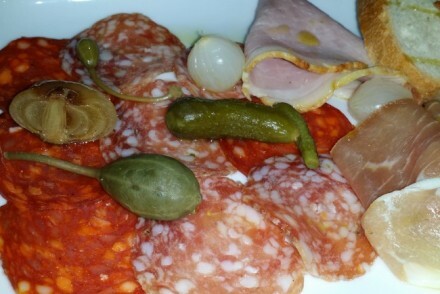 Desserts, breads, sauces and condiments are all made in-house. Designed by Koichi Yasuhiro from Tokyo’s renowned Design Studio SPIN, Sundara spans 29,437 sq feet across two levels to create a variety of spaces to suit any dining occasion. 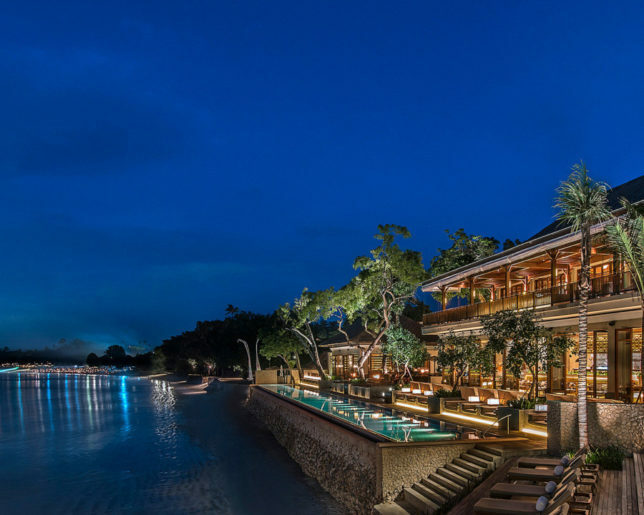 The expansive indoor-outdoor design of the Balinese-style pavilions combines a restaurant with mezzanine, air-conditioned bar, open-air terrace and beach-front daybeds for lounging by the 57-meter Infinity Edged Pool. 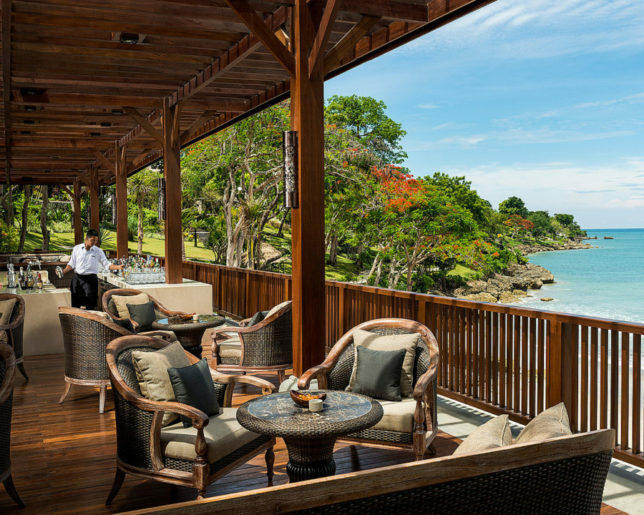 Your eyeline is always on views of the beach and the wide curve of Jimbaran Bay. 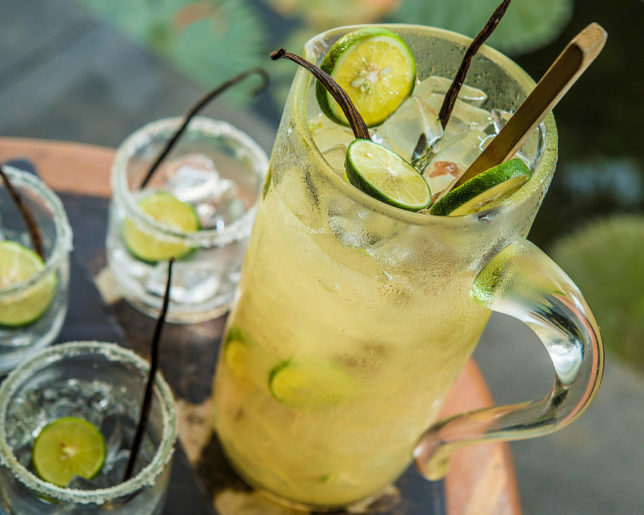 The ground level beach-front area features the intimate Sundara Bar, open-air dining room and Sundara Patio with open-concept kitchen, as well as a central al fresco area with low tables and fire pits. Just below, the lower deck offers daybeds for lounging by the pool and a row of sun lounges just steps from the sand. The upper level features the open-air Sundara Mezzanine Bar and a spectacular air-conditioned dining room set beneath a lofty thatched roof. As the sun goes down, the fire pits are lit and Sundara transforms into one of Bali’s most unique dining destinations, with Executive Chef Pasquo King offering ‘customized dining’ with Modern Asian cuisine by the sea. 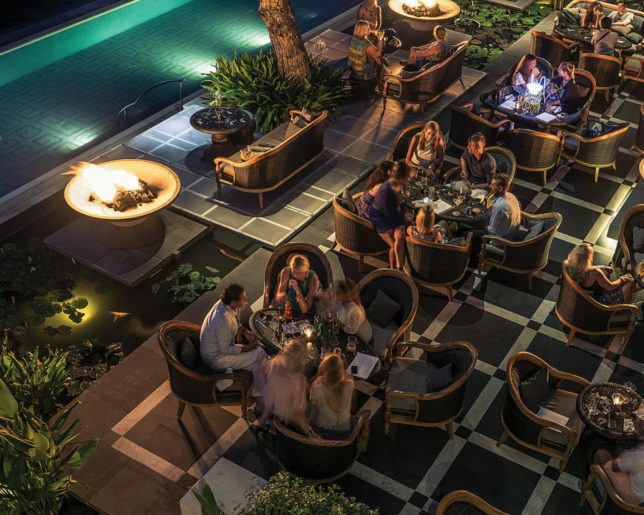 In the evening twilight, the restaurant buzzes with a cosmopolitan energy and live music from Bali’s top indie artists ranging from jazz, blues and soul to acoustics. 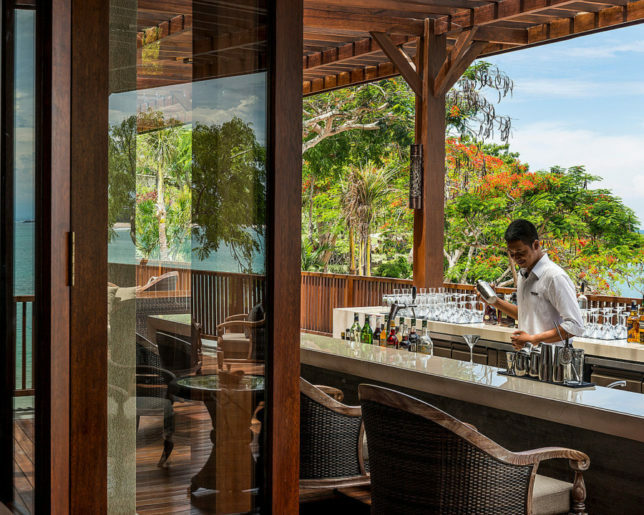 It’s the perfect relaxed vibe to enjoy a sundowner cocktail before dinner. 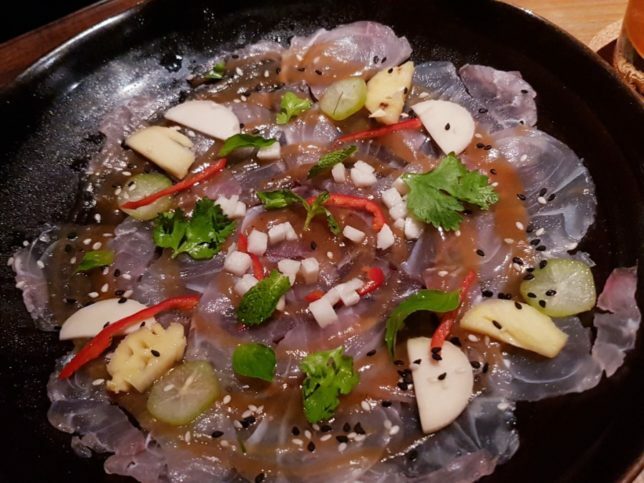 Moving away from the formality and pricing typical of hotel restaurants, the dinner menu is divided into three sections (cold, hot and sweet) with each dish available in three sizes (small, medium and large). 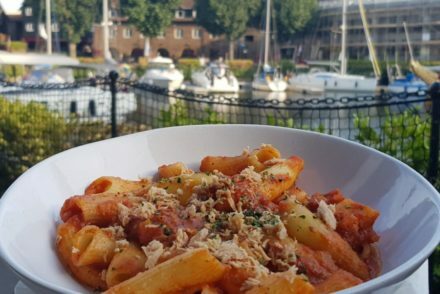 This enables diners to choose their style of service and customize their experience to suit any occasion, whether a casual dinner with friends, intimate date night, or evening with the family. 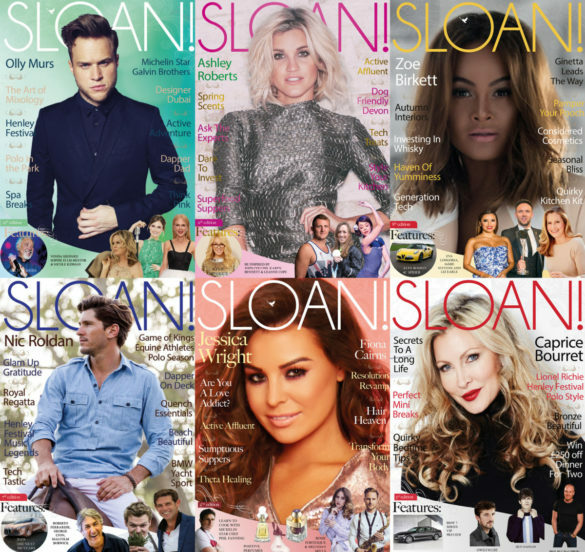 On top of all this, the service is friendly, professional, efficient, and guaranteed to just ‘get you right’. 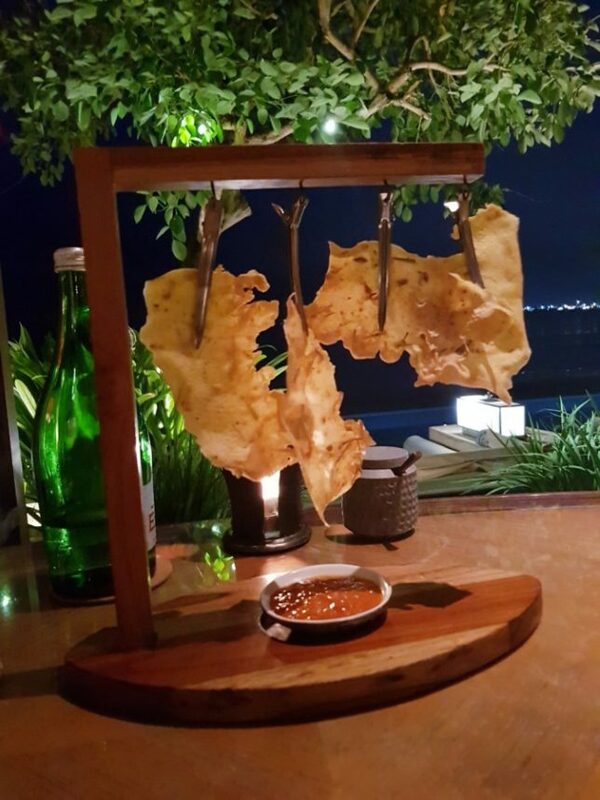 To start our Modern Asian culinary adventure, we had a selection of hanging poppadoms. 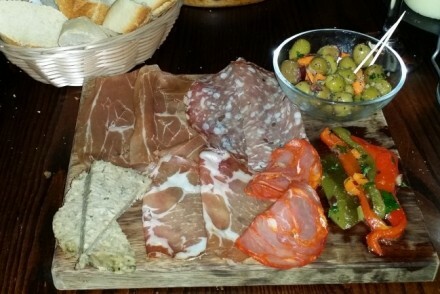 These were a great way to whet our appetite for the fantastic meal ahead. 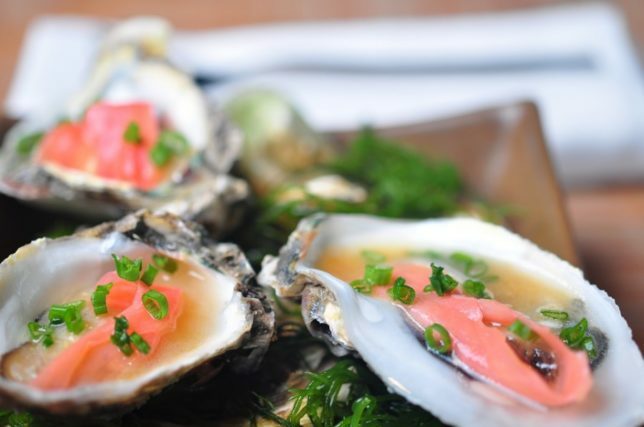 Being so close to the sea we thought it would be perfect opportunity to sample the Lombok Oyster chilled with Japanese Dressing, Scallions and Pickled Ginger. 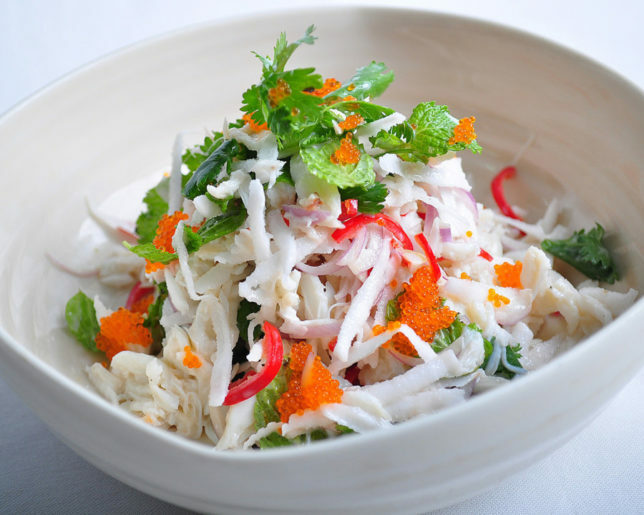 My dining companion had the scrumptious Crab and Coconut with Asian Herbs, Grated Coconut, and Lime Palm Sugar Dressing. 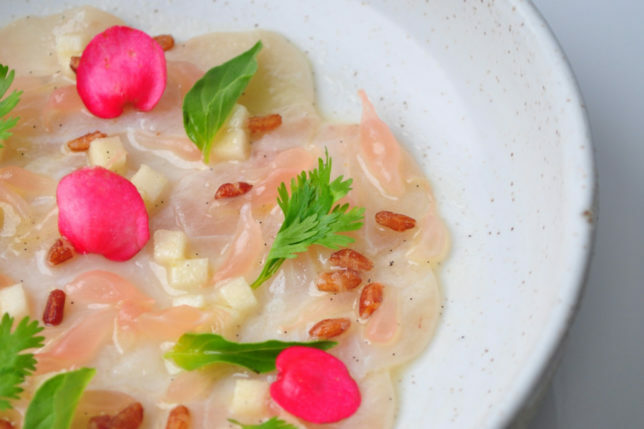 The Red Snapper Carpaccio was so fresh and flavourful it left us wanting more. 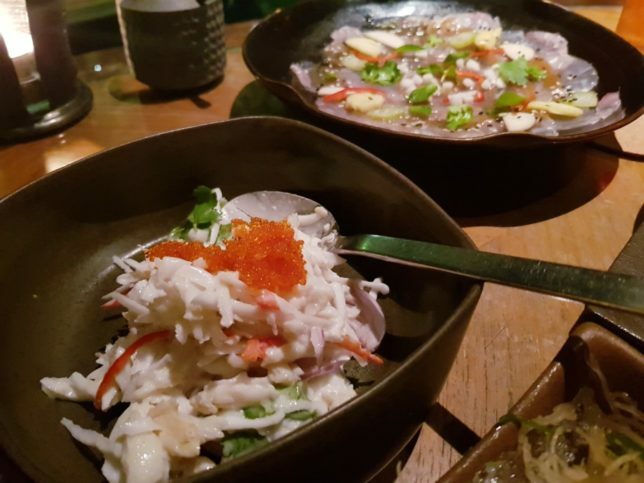 The freshest fish dish came with Pomelo, Jicama, Local Celery, Belimbing Buluh, Peanut and Rujak Sauce. 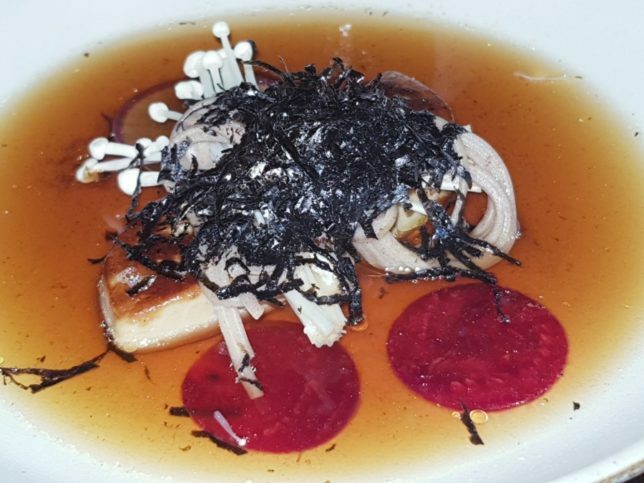 We also tried the Torched Foie Gras served with Lightly Pickled Radish, Soba, Enoki and Dashi Broth. 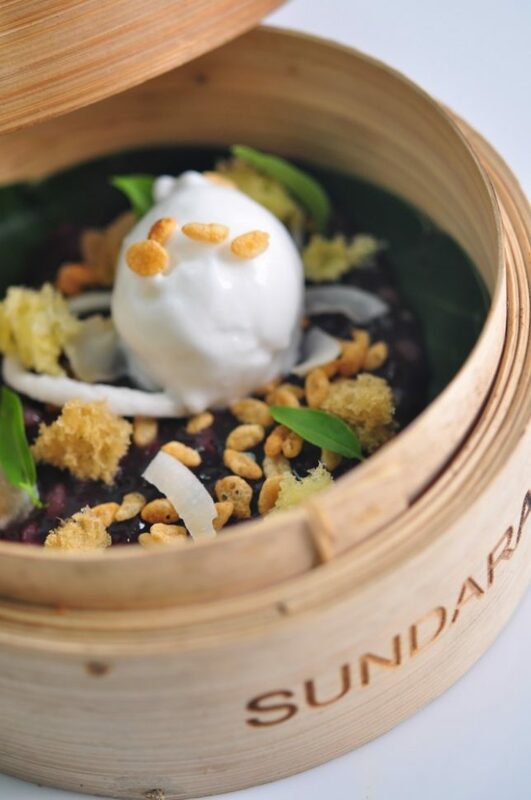 This dish underlined the luxurious dining offered at Sundara and we could clearly see why this Four Seasons restaurant is so popular with gastronomes and romantic couples alike. 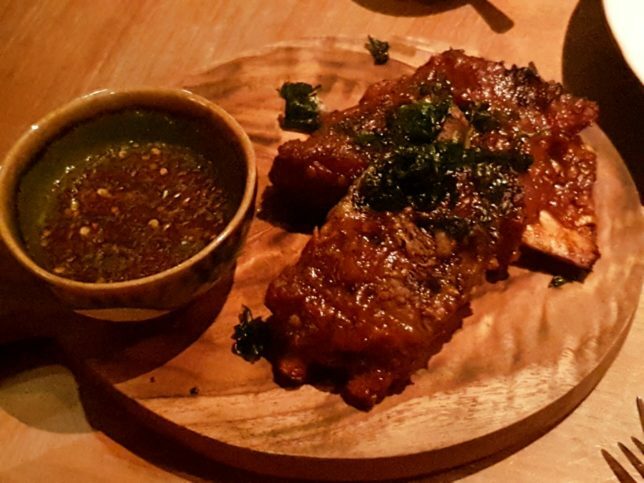 The Thai Style Pork Ribs had an authentic flavour and the fork tender texture delighted the palate as did the accompanying Nam Prik Pla Dipping Sauce. 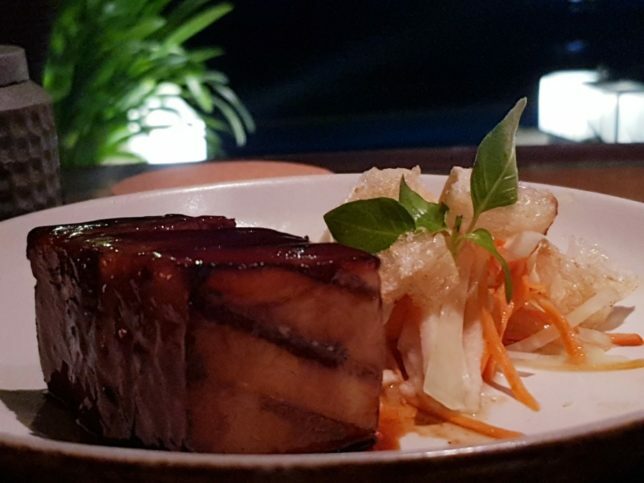 One of best BBQ Pork Belly dishes we have tried, this was tender, meaty and flavourful served with Char Siew Sauce, Vietnamese Salad and Crispy Pork Cracker. 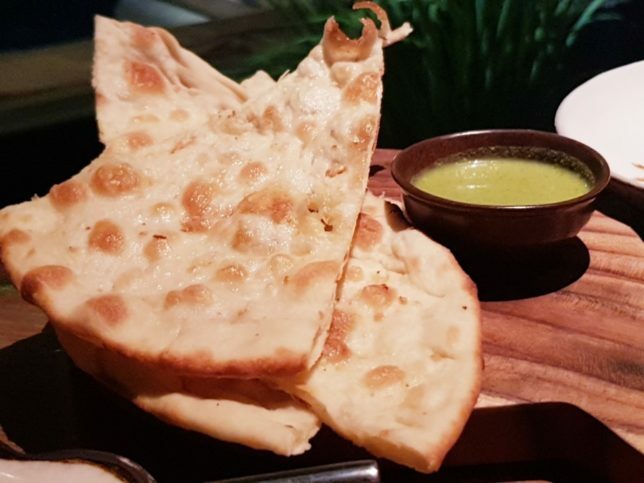 As a tasty accompaniment, we also shared some Garlic Naan between the two of us. 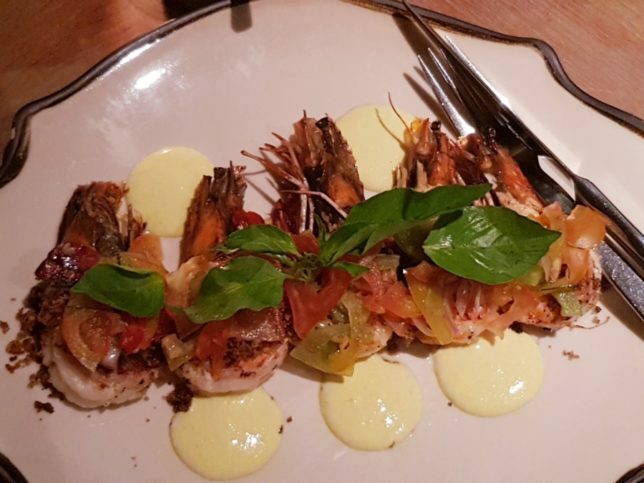 We also enjoyed the Grilled King Prawns with Dabu, Pomelo, Urutan Crumbs and a delicious Spiced Cream. 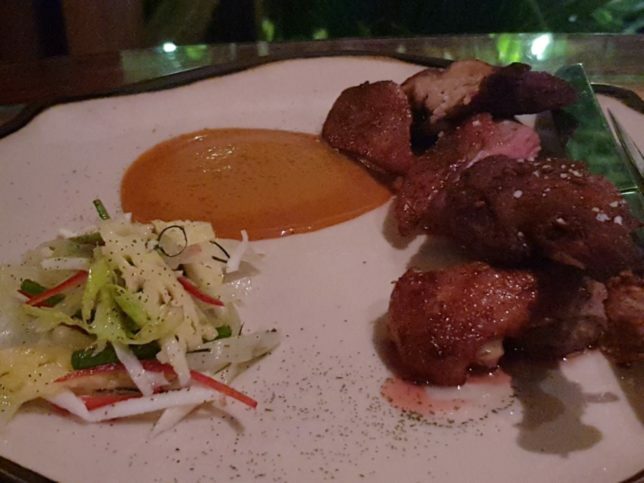 Another must-try on the menu is the Twice Cooked Duck with Shaved Coconut, Pineapple, Chinese Celery and Red Curry Dressing. The duck was served medium rare and had a beautifully flavoured skin. This dish was finished off with a vibrant red curry sauce for a pleasant fiery kick. For the dessert menu at Sundara, Executive Pastry Chef Yusuke Aoki has created an imaginative selection of sweets that promise the perfect finish to a memorable meal which will have you already planning your next visit to Sundara.